Innovative filler technology for improved physical properties and dimensional stability. Excellent wettability and moisture displacement. Mint scent. Setting phase is temperature activated; it moves quickly into the "setting phase" immediately upon inserting the tray into the mouth. Contains: 2 x 50ml cartridges, 12 small (yellow) mixing tips. Contains: 2 x 50ml cartridges, 8 mixing tips. Contains: 2 x 50ml cartridges, 6 large (turquoise) mixing tips. Mixing tips have a yellow hub, clear barrel, and white mixer. Mixing tips have a teal hub, clear barrel, and white mixer. Virtual was used by 30 consultants in making over 600 impressions, which included the use of the heavy/light, putty/light, monophase, and bite registration materials. This product received a 96% clinical rating. Virtual is a line of addition silicone impression materials indicated for all crown and bridge and removable prosthetic impressions. The viscosities evaluated were Light Body, Heavy Body, Monophase and Putty, in both regular- and fast-set formulations. The light body is a “khaki” beige color; the monophase, heavy body and putty are all “denim” blue. The vast majority of consultants were very positive about the simple packaging, clear labeling and automix delivery system of Virtual. The viscosity of the lightbody material is excellent, as it flows well into the sulcus and does not slump. 60% of consultants noted that Virtual behaved much like a hydrophilic material, displacing moisture and resulting in very accurate impressions with excellent reproduction of detail. Color contrast of the “khaki” and “denim” hues make margins easy to read. Consultants commented favorably on the setting times of both the regular- (4.5 minute) and fast-set (2.5 minute) materials. 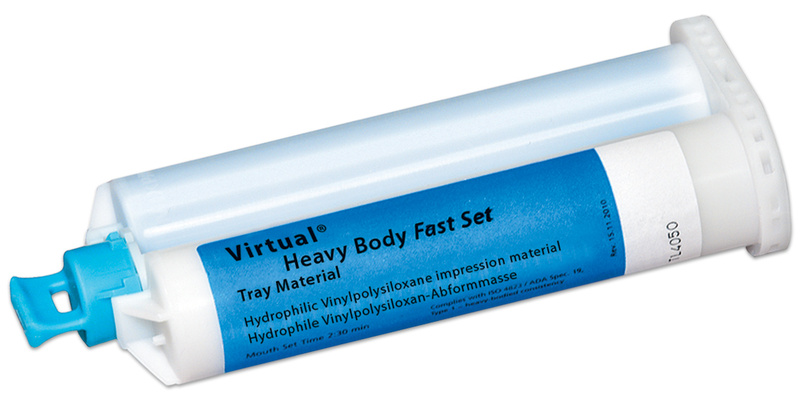 The fast-set materials are ideal for 1 or 2 preparations. Patients appreciated the reduced time in the mouth as well as the neutral taste of the material. 93% of consultants noted that Virtual was as good as or better than the impression material they were currently using, and 40% would switch to it.